Why spend your time and money on a cruise filled with strangers when you can have your very own private Alaskan charter boat? 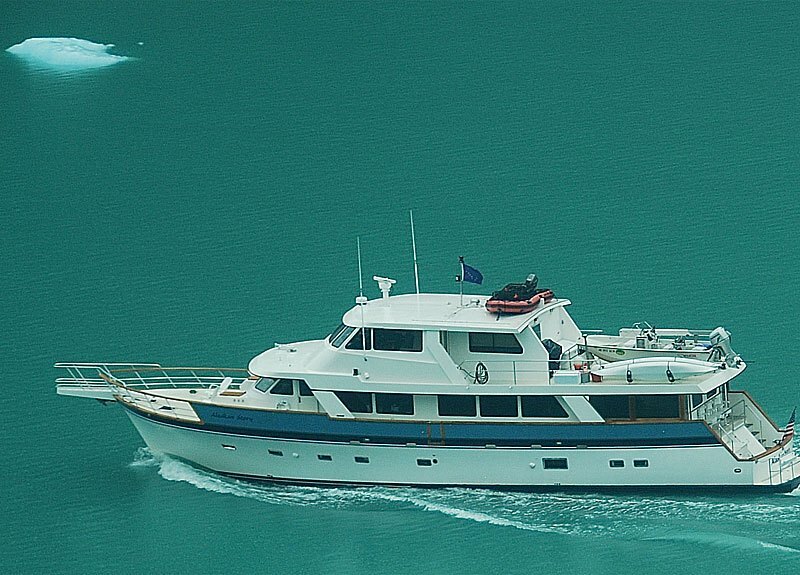 Alaska Yacht Charter’s 90 foot Westport yacht Alaskan Story is large and fast with spacious comfortable common areas for fishing, watching wildlife and scenery or just relaxing. The owners, Debbie and Geoff with a combined 60 years experience chartering in Alaska, designed the Alaskan Story just for you. “We started chartering in Alaska in 1988, first with a 65 foot Norwegian trawler the Viking and then on the 90 foot wood and aluminum Alaskan Song built in 1944. We purchased the Alaskan Story in 2001. We redesigned and completely rebuilt this 90 foot Westport in the following two years to give our guests the best Alaskan charter yacht: New teak interior, all new stainless-steel appliances, new aft dining area with 270 degree view and enclosed top deck pilothouse where the guests can sit comfortably with the Captain and view the natural beauty and wildlife of Southeast Alaska. The galley, saloon, dining area and day head are all on the main level. 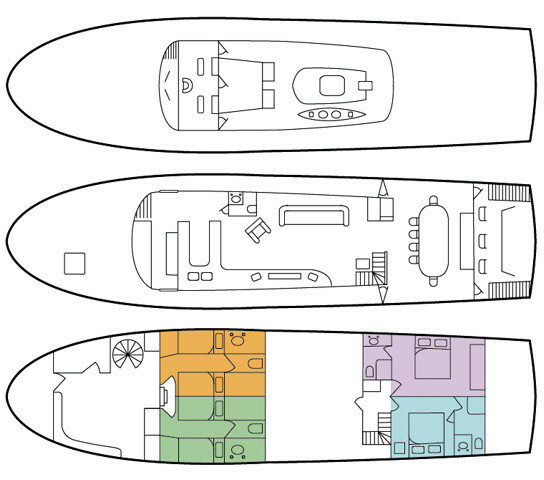 Two aft staterooms have walk-around queen beds and the two forward staterooms have two twins each. Of course all the staterooms have bathrooms including showers ensuite. Each stateroom has its own thermostat to control heat. There is a spacious TV/Reading room forward and additional cabins and bathroom for crew. Alaska Yacht Charter’s Alaskan Story has all the safety equipment required by the United States Coast Guard and has receive a “five star” rating in a voluntary inspection by the Coast Guard Auxiliary. This safety rating is the highest granted; and only to those vessels that go well beyond the requirements. The Alaskan Story has automatic satellite locating beacons and life rafts that are required to be inspected annually. Of course we have extensive first aid supplies and an Automated External Defibrillator (AED), At least two of our crew will always be certified by a Coast Guard approved first aid and CPR course. The Alaskan Story has a seventeen foot Boston Whaler with 90 horsepower four stroke Honda outboard. As a backup we have a 12 foot rigid-bottom inflatable with 18 hp four stroke outboard. We have three double kayaks. We provide all salt-water fishing gear for both salmon and halibut and have crab and shrimp pots. There is a large collection (hundreds) of books, music CD’s and DVD videos and two flat screen TVs; one with Bose surround sound system. Mechanical: The Alaskan Story is powered by twin 570 horsepower turbocharged Caterpillar engines. She has two AC generators of 27.5 and 20 kilo-watts. She has large inverters and battery banks which allow the generators to be turned off at night for the quiet enjoyment of the anchorage and wildlife. She has a water-maker capable of making up to 1200 gallons of water a day. Electronics: Consistent with belief in the necessity of redundancy in all essential systems, the Story has three independent computer systems for navigation, using electronic charts from several manufacturers. The vessel is equipped with GPS, AIS and 24 and 48 mile radars. Fire extinguishers are throughout the vessel and the engine room has an automated system. We made our Alaskan Story the best equipped yacht in Southeast Alaska to assure you of the best and safest Alaskan cruise.